Yelp + Angie’s List + Facebook = Whodoyou? What would you get if you put Yelp, Angie's List, and Facebook in a blender? The result might look a little something like whodoyou, which mines content and advice shared on Facebook and other social network to provide recommendations for local businesses in the top 500 cities in the U.S. and more than 50 international markets. What would you get if you put Yelp, Angie’s List, and Facebook in a blender? The result might look a little something like whodoyou, which mines content and advice shared on Facebook and other social network to provide recommendations for local businesses in the top 500 cities in the U.S. and more than 50 international markets. whodoyou was founded in 2012 by former Microsoft Group Program Manager Yoav Schwartz and former Answers.com Chief Technology Officer Jeff Schneiderman, and the company recently raised $900,000 of angel funding from investors including former 888.com CEO Gigi Levy, OurCrowd Founder and CEO Jon Medved, Isaac Applbaum, Mike Granoff, former Facebook Director of Business Development Net Jacobsson, Hostway Founder HanJoo Lee, 18 Partners, and Ronald Lauder Ventures. Applications for iOS and Android are currently under development, whodoyou said. I found it frustrating when doing my own home renovation recently that all of the trusted referrals shared with me on Facebook, email, and by word-of-mouth were completely lost. There was no single location to capture — and share back out — all of this incredibly useful advice. So I decided to build a platform that would store all of these nuggets of gold. Now people can “reclaim” the advice shared on social networks. 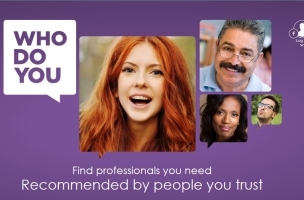 We are passionate about helping users find the professionals they need, recommended by the people they trust. It’s a totally new kind of social local search. I was compelled by whodoyou’s ability to scale. Angie’s List adds 60,000 reviews per month, and it took it nearly 20 years to get there. whodoyou is now gathering more than 30,000 public recommendations per month, and it has been at this less than a year. Readers: Where do you turn for online recommendations?